Last week, I posted a kalbi beef bento and mentioned that I should have cut the meat into very thin strips to make for easier eating. 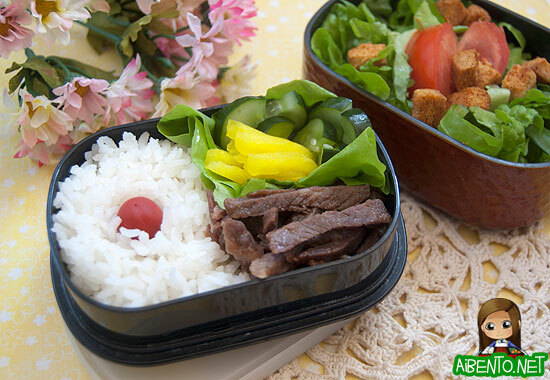 In this bento, I’ve done just that, using kitchen shears to shred the meat into little strips that make for better presentation and very easy eating. I used a lettuce leaf as a food divider for my pickled veggies, which included slices of cucumber kim chee and strips of takuan. On the left I stuck a little ume into my rice to round out the colors. Since we have enough lettuce to keep us in salad for a few months, I have to do my part to help eat it so I packed a side salad to eat with my lunch. The tomato is bought from a store, but soon we’ll have our own tomatoes to eat as Mr. Pikko has some coming in soon. I made those croutons myself from the leftover bread from the Giant Jam Sandwich I made on Fictional Food. If you’re wondering why they’re so dark, it’s because I left them in the oven way too long, not realizing that cutting the bread up into really tiny pieces meant I should cut the time nearly in half… So now I have this huge ziploc bag of nearly burnt croutons.